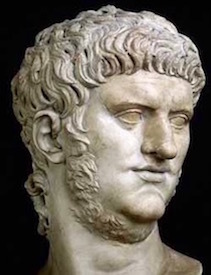 Pertinent to the Quo Vadis story, Nero as Emperor had every thing, but he hated Rome and thought it looked like a pigsty. 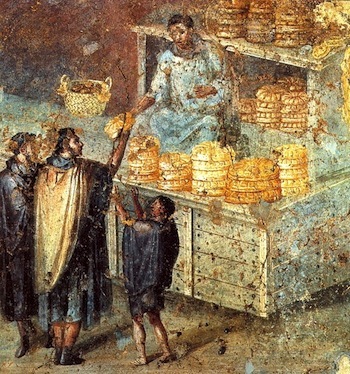 He envisioned Rome as Nero’s Golden City if he could only get rid of squalid, crooked, cramped Rome. He wanted a Rome of shining buildings, straight thoroughfares and clean streets. 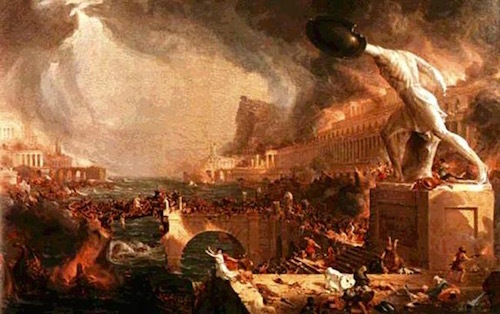 In 64 he instructed his lackeys to burn Rome to the ground so he could start over. “…the conflagration both broke out and instantly became so fierce and so rapid from the wind that it seized in its grasp the entire length of the circus….The blaze in its fury ran first through the level portions of the city, then rising to the hills, while it again devastated every place below them. 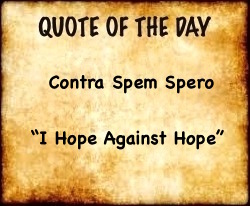 “…it outstripped all preventive measure; so rapid was the mischief and so completely at its mercy the city, with those narrow winding passages and irregular streets which characterized old Rome. Added to this were the wailings of terror-stricken women, the feebleness of age, the helpless inexperience of childhood, the crowds who sought to save themselves or others, dragging out the infirm or waiting for them, and by their hurry in the one case, by their delay in the other, aggravating the confusion…they found that, even places which they had imagined to be remote, were involved in the same calamity. 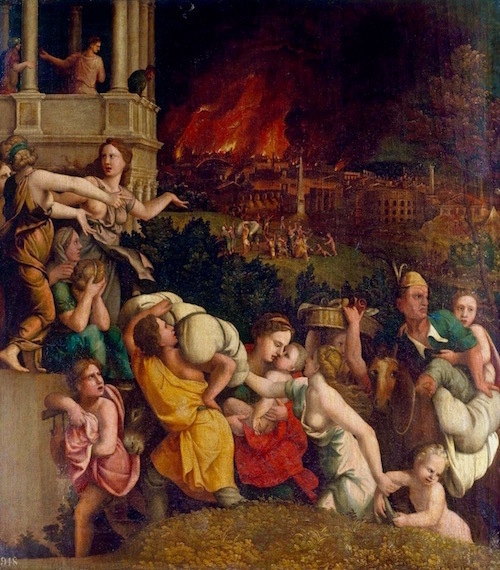 “…And no one dared to stop the mischief because of incessant menaces from a number of persons who forbade the extinguishing of the flames…others openly hurled brands and kept shouting that there was one who gave them authority….a rumor had gone forth everywhere that at the very time when the city was in flames, the emperor appeared on a private stage and sang of the destruction of Troy, comparing present misfortunes with the calamities of antiquity. “At last, after five days, an end was put to the conflagration at the foot of the Esquiline hill, by the destruction of all buildings on a vast space, so that the violence of the fire was met by clear ground and an open sky. 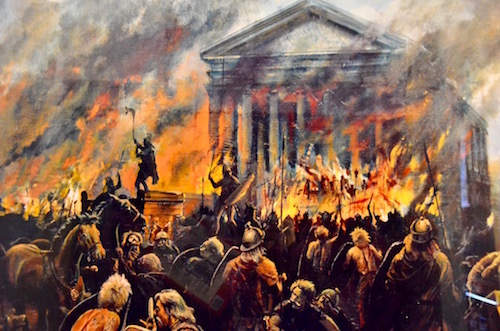 But before people had laid aside their fears, the flames returned, with no less fury this second time….the temples of the gods and the porticoes which were devoted to enjoyment fell in a yet more widespread ruin. The people, already willing to believe that he had started the fire, became riotous. 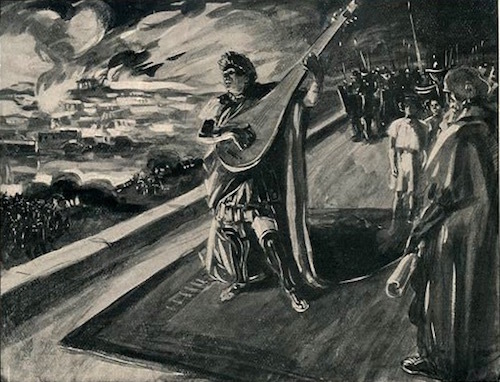 They chanted, “Nero Incendiarius, Nero Incendiaries” (“Nero the Arsonist”). 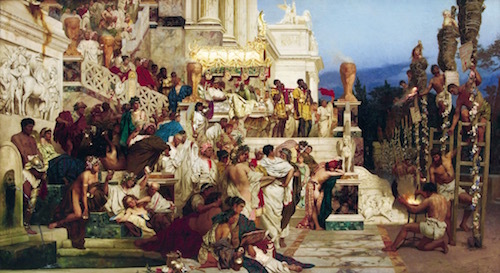 In order to stave off a public lynching, Nero immediately accused a new sect called “Christians” for burning the city. He rounded up Christians, wrapped them in pitch, dipped them in tar and burned them as torches for his dinner parties. He sewed them in animal skins and threw them to the dogs at the circus near Vatican Hill. His cruelty was so extreme that the people began to have sympathy for the Christians.